Ken Bruen is one who can deliver a line that cuts to the core. In general, is it a good thing to have the language be so beautiful and mesmerizing? Hmmm. Obviously, the use of language is important, but there is always a risk that it will sound forced, pushed, or pull people out of the story as they savour phrasing. I suppose it's like all things in books. It can be a good thing, it can be a bad thing. No one uniform answer. I don't know about beauty of prose, but I'm reading Lawrence Block's "Burglar" books right now, and I find myself stopping to admire the way he sets up Bernie's wisecracks. Linkmeister, Block is a master, beautiful prose or nor, so he'd qualify for this discussion. (I've read books from most of the sectors of Block's vast output, and I like the Rhodenbarr short stories better than the novels.) In any case, stopping to indulge in admiration is a good thing as long as you go back to the story when you're done. I'm sure Block would concede this. Sandra, Ken Bruen is also a candidate for this question for the laugh-out-loud lines and self-referential jokes in Bust, Slide and the Brant and Roberts novels. No one, uniform answer, of course, but it may worthwhile mentioning that reading is probably rarely, if ever, completely linear and all in one direction, anyway. We stop, look back, think ahead the like, whether we're conscious of doing to or not. And that's all the theory you'll get from me. I do think that the question is likelier to arise with a slower-paced, lyrical writer such as Peter Temple than with more action-packed crime writers. 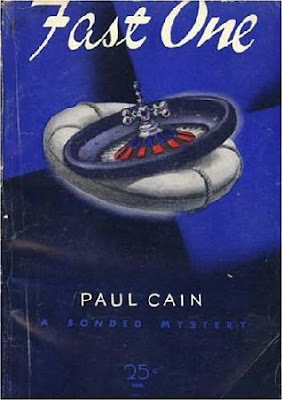 And I likely would never have asked myself the question had I not been reading two such different writers as Peter Temple and Paul Cain at the same time. Temple does the things other crime writers do, but he'll add that extra charge, that extra little touch that keeps me interested: the deadpan elliptical transitions or, especially, the descriptions of the protagonist's outside interests. Crime writers by the score will do the latter but rarely in so compelling and even beautiful a manner as in, say, the descriptions of Jack Irish's cabinet work. An author has got to be pretty confident of his technique to believe that he can do that and still hold the reader's attention. With Temple, it always works. It's been years I read Chandler, but I'd vote him. Kevin Wignall's simple prose is haunting, as is Elizabeth Sanxay Holding's. Chandler's worth a vote. He can be lyrical, tense and funny. I like your description of Kevin Wignall's prose. I'll step up my search for his work. Any recommendations? I had not heard of Elizabeth Sanxay Holding, but I see Chandler himself was a fan of her work, which by itself makes her a figure of interest. I tend to think more of lines in the Jack Taylor books, some of which cut to the core. Sandra, I had a feeling that was the case. My pattern of reading Bruen is probably different from those of most readers. I read the six Brant and Roberts books and Bust before I read my first Jack Taylor novel, The Magdalen Martyrs. There's a decided shift to the sad and poignant in that last book, even in the funny lines. I suspect you may have that type of line in mind. The Magdalen Martyrs is closer in tone to some of those wonderful pieces Bruen has been posting on Murderati. Yes, and you should read The Guards, the first Jack Taylor book, and all through. But then, bear in mind I've also read some (as of yet) unpublished Bruen, so I can't cite all my sources. I think Ken is capable of covering the spectrum, but the sad, poignant stuff resonates with me. My favourite Bruen quote is "I only know the heart exists on what it daren't lose." I thought I might read Cross next. I saw the video that Ali Karim made of Bruen reading the first chapter. Bruen is a fine reader, but the main attraction for me was his ability to make the scene funny and chilling at the same time. It's a stunning piece of writing, to my mind. Series order be damned! I'll let myself be surprised by the discoveries that can come from reading non-chronologically. I was very impressed with Daniel Woodrell and some of his succint use of words in his Ozark noir novel Tomato Red. I felt I was there in the trailer park with the characters. But of course the Camilleri/Sartarelli combo are pretty good too when it comes to descriptions of food. The one time I flipped through a Woodrell novel in a bookshop, it did not grab me, perhaps because my expectations were so high. Everything I'd read about Woodrell had raved about his prose style. Oddly enough, what sticks with me about Camilleri's descriptions of food are less the dishes themselves than the situations in which Montalbano eats them: He comes home to find a dish the maid had prepared for him, or his misgivings before he digs into a massive helping of some trattoria's daily special. I get instant and vivid pictures of these situations, especially the former. I'd call that a high compliment to the Camilleri/Sartarelli team. One of my favorites is William Kent Krueger and his Cork O'Connor series. He subtly turns his characters into your literary friends - people whose company you would enjoy in real time. I haven't him, but his name is mentioned with respect in the best circles. Any suggestions about which book to start with? I first read Ordinary Grace which is a standalone, but it was so good that I wanted to read more of his work. I started with his first book in the series Iron Lake and have more or less read them in the order they were published. In this series I am glad I have. It gives you those little "aha" moments of familiarity and saying "I remember when that happened." Thanks. I'll keep Krueger high on my list of post-Bouchercon reading. And reading a series out of order can offer its own pleasures, too. I can remember only one series that I read out of order and wished I had done otherwise, but I recovered from the brief plot shock. In any case, the out-of-order reading was not my fault; the books were translated into English out of order.